Before, we look at the most significant commands for connectivity checking and troubleshooting, here is little reminder on how to check host computer's network interface parameters on . The Microsoft windows have a whole set of helpful command line tools that helps testing and configuring LAN/WAN interfaces. We will look only at commonly used Windows networking tools and commands. All of the tools are being ran from windows terminal. Go to Start/Run and enter "cmd" to open a Command window. ipconfig – used to display the TCP/IP network configuration values. To open it, enter "ipconfig" in the command prompt. There are also a variety of additional functions for ipconfig. To obtain a list of additional options, enter "ipconfig /?" or “ipconfig -?”. netstat – displays the active TCP connections and ports on which the computer is listening, Ethernet statistics, the IP routing table, statistics for the IP, ICMP, TCP, and UDP protocols. It comes with a number of options for displaying a variety of properties of the network and TCP connections “netstat –?”. nslookup – is a command-line administrative tool for testing and troubleshooting DNS servers. For example, if you want to know what IP address is "www.google.com", enter "nslookup www.google.com" and you will find that there are more addresses 74.125.77.99, 74.125.77.104, 74.125.77.147.
netsh – is a tool an administrator can use to configure and monitor Windows-based computers at a command prompt. It allows configure interfaces, routing protocols, routes, routing filters and display currently running configuration. ifconfig – it is similar like ipconfig commands on windows. It lets enable/disable network adapters, assigned IP address and netmask details as well as show currently network interface configuration. iwconfig - iwconfig tool is like ifconfig and ethtool for wireless cards. That also view and set the basic Wi-Fi network details. nslookup – give a host name and the command will return IP address. ip – show/manipulate routing, devices, policy routing and tunnels on linux-machine. mentioned tools are only small part of networking tools that is available on Linux. Remember if you want full details on the tools and commands options use man command. For example, if you want to know all options on ifconfig write command man ifconfig in terminal. Ping is one of the most commonly used and known commands. Administration utility used to test whether a particular host is reachable across an Internet Protocol (IP) network and to measure the round-trip time for packets sent from the local host to a destination host, including the local host's own interfaces. Ping uses Internet Control Message Protocol (ICMP) protocol for echo response and echo request. Ping sends ICMP echo request packets to the target host and waits for an ICMP response. Ping output displays the minimum, average and maximum times used for a ping packet to find a specified system and return. PING 10.255.255.6 (10.255.255.6) 56(84) bytes of data. Press Ctrl-C to stop ping process. Traceroute displays the list of the routers that packet travels through to get to a remote host. The traceroute or tracepath tool is available on practically all Unix-like operating systems and tracert on Microsoft Windows operating systems. Traceroute operation is based on TTL value and ICMP “Time Exceeded” message. Remember that TTL value in IP header is used to avoid routing loops. Each hop decrements TTL value by 1. If the TTL reaches zero, the packet is discarded and ICMP Time Exceeded message is sent back to the sender when this occurs. Initially by traceroute, the TTL value is set to 1 when next router finds a packet with TTL = 1 it sets TTL value to zero, and responds with an ICMP "time exceeded" message to the source. This message lets the source know that the packet traverses that particular router as a hop. Next time TTL value is incremented by 1 and so on. Typically, each router in the path towards the destination decrements the TTL field by one unit TTL reaches zero. Using this command you can see how packets travel through the network and where it may fail or slow down. Using this information you can determine the computer, router, switch or other network device that possibly causing network issues or failures. Traceroute and tracepath is similar, only tracepath does not not require superuser privileges. System event monitoring facility allows to debug different problems using Logs. Log file is a text file created in the server/router/host capturing different kind of activity on the device. This file is the primary data analysis source. RouterOS is capable of logging various system events and status information. Logs can be saved in routers memory (RAM), disk, file, sent by email or even sent to remote syslog server. All messages stored in routers local memory can be printed from /log menu. Each entry contains time and date when event occurred, topics that this message belongs to and message itself. Torch is real-time traffic monitoring tool that can be used to monitor the traffic flow through an interface. You can monitor traffic classified by protocol name, source address, destination address, port. Torch shows the protocols you have chosen and tx/rx data rate for each of them. Note: Unicast traffic between Wireless clients with client-to-client forwarding enabled will not be visible to torch tool. Packets that are processed with hardware offloading enabled bridge will also not be visible (unknown unicast, broadcast and some multicast traffic will be visible to torch tool). The following example monitor the traffic generated by the telnet protocol, which passes through the interface ether1. Warning: Traffic that appears in torch is before it has been filtered by Firewall. This means you will be able to see packets that might get dropped by your Firewall rules. By default ping tool will take IPv4 address. More attractive Torch interface is available from Winbox (Tool>Torch). In Winbox you can also trigger a Filter bar by hitting the F key on the keyboard. Packet sniffer is a tool that can capture and analyze packets sent and received by specific interface. packet sniffer uses libpcap format. 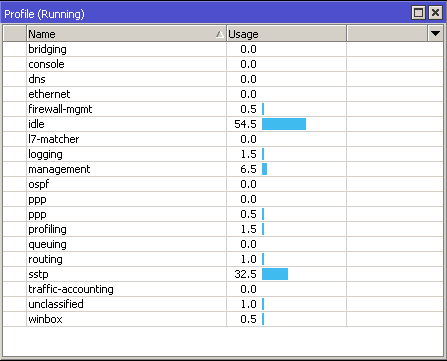 Here you can specify different packet sniffer parameters, like maximum amount of used memory, file size limit in KBs. /tool sniffer start, /tool sniffer stop, /tool sniffer save. The start command is used to start/reset sniffing, stop - stops sniffing. To save currently sniffed packets in a specific file save command is used. There are also available different submenus for viewing sniffed packets. Figure below shows sniffer GUI in Winbox, which is more user-friendly. The Bandwidth Tester can be used to measure the throughput (Mbps) to another MikroTik router (either wired or wireless network) and thereby help to discover network "bottlenecks"- network point with lowest throughput. TCP – uses the standard TCP protocol operation principles with all main components like connection initialization, packets acknowledgments, congestion window mechanism and all other features of TCP algorithm. Please review the TCP protocol for details on its internal speed settings and how to analyze its behavior. Statistics for throughput are calculated using the entire size of the TCP data stream. As acknowledgments are an internal working of TCP, their size and usage of the link are not included in the throughput statistics. Therefore statistics are not as reliable as the UDP statistics when estimating throughput. UDP traffic – sends 110% or more packets than currently reported as received on the other side of the link. To see the maximum throughput of a link, the packet size should be set for the maximum MTU allowed by the links which is usually 1500 bytes. There is no acknowledgment required by UDP; this implementation means that the closest approximation of the throughput can be seen. Remember that Bandwidth Test uses all available bandwidth (by default) and may impact network usability. Bandwidth Server – router under test – Bandwidth Client. Note: If you use UDP protocol then Bandwidth Test counts IP header+UDP header+UDP data. In case if you use TCP then Bandwidth Test counts only TCP data (TCP header and IP header are not included). Run UDP bandwidth test in both directions, user name and password depends on remote Bandwidth Server. In this case user name is ‘admin’ without any password. Profiler is a tool that shows CPU usage for each process running on RouterOS. It helps to identify which process is using most of the CPU resources. This page was last edited on 29 November 2018, at 17:49.